Hillary Rodham Clinton may be the Democrats' top presidential candidate, but 22 years ago she was just another First Lady trying to steal a few minutes to herself on a GameBoy. 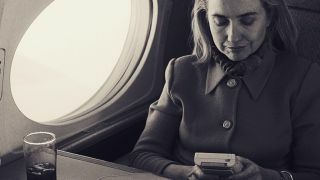 OK, her life experiences are still unrelatable to ... everyone, but a retro picture posted to the William J. Clinton Library's official Instagram account shows HRC knows her way around a "Nintendo 'Game Boy' electronic game." Clinton's people may want to get her up to speed on today's lingo before she starts asking voters what their favorite "electronic game" is. Just a thought.